As a project manager and coordinator of various teams I had always to do with the topic named stress. It is a common sense that the word project is bound to the word stress and they build a couple that is present in every project. You will hear such sentences like “it was stressful”, “we had too much stress” etc. during almost every review or retrospective meeting. As you can see we have three curves. The internal stress curve depicts the stress level caused by the internal characteristics of every project member. We are all humans. You can also understand it as the excitement curve. 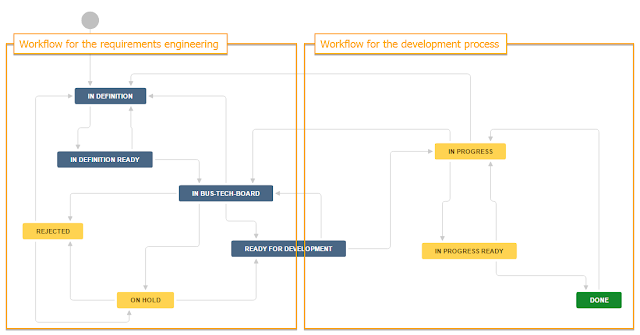 At the beginning of a project, during transition between the plan and build phases, every member of a project team is excited to some extent. During the build phase the stress strength is quite low, and explodes at the end of the project. “We are going live!”. Second curve is the external stress curve that depicts the stress level caused by the external factors like low skills, bad planning, micro management, lack of processes and all that stuff classified as the project risks. As you can see, even if the roots are quite different the flow of the external stress curve is almost identical to the internal stress curve, however with stronger amplitude. What is however really important is the fact that these two curves interfere and build the stress strength interference curve, which values can suddenly reach the threshold of unhealthy stress strength. Unhealthy stress strength is simply… unhealthy. The most common symptom of it is the disintegration of the team, thus the transition from the team to the group of individuals. 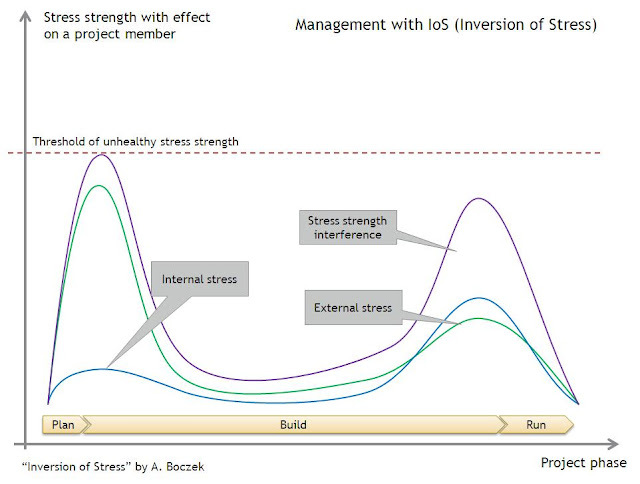 To avoid such situation, I have introduced in my latest two projects a method named Inversion of Stress (IoS). This name might not be the perfect one for that solution but nowadays everyone would like to have something based on iOS, me too, so I have invented the IoS :)… Ok, back to business. 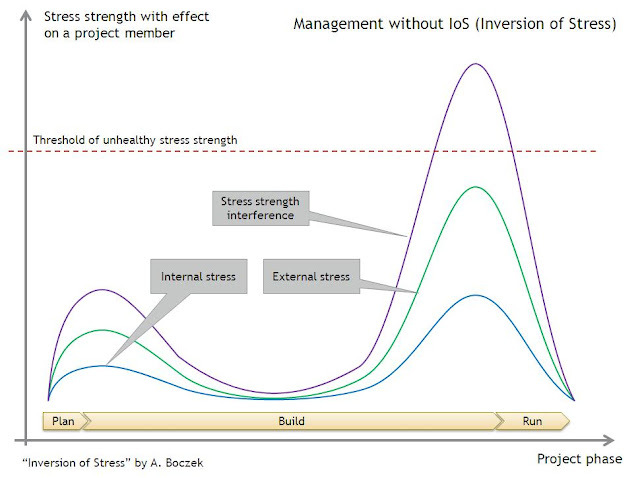 The only curve a project manager or a coordinator has influence on, is the external stress curve. Knowing that its normal behavior means high stress strength at the end of the project I have decided to simulate this behavior… at the beginning of the project. That is the inversion. The aim was to recognize where the threshold of unhealthy stress strength is. Due to the fact that these actions were introduced under my strict control I was able exactly to observe the results and to avoid the risks of the exceedance of the threshold of unhealthy stress strength at the end of the project. As a sidenote: In psychology there exist concepts for positive and "healthy" stress (called eustress) and negative and "unhealthy" stress (called distress). I find the idea to experimentally determine the maximum positive stress level very appealing, but there might be one caveat: Over time the ability of the team to cope with stress might change through additional internal or external factors that are not recognizable by us. Thus the once determined threshold might no longer be the same. One example for an internal factor might be the different phases of the group forming if you have a new team that hasn't worked together before. An example for an external factor might be a disruptive change in the company that employs the members of your team. @Joachim: many thanks for this valuable comment. It seems to be an interesting idea to look at the project stress curves describe above from the eustress and distress point of view. You are right that the stress strength threshold value changes over the time because of some new external or internal factors that are not present at the beginning of the project. However the question is how do you define this threshold? 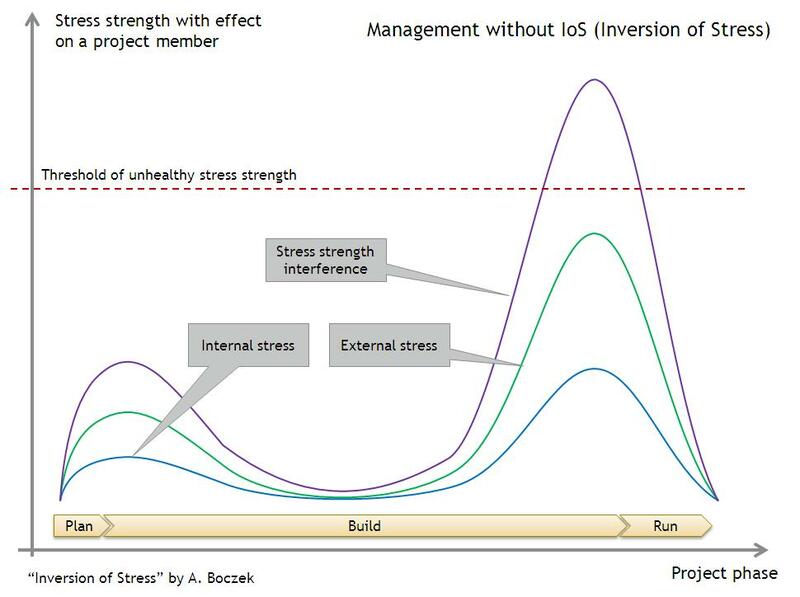 It is not defined by any fixed value (I suppose it would be even difficult to find a proper measurement) but by the behavior of the project environment (mainly the project team) the stress strength has influence on. It is about symptoms. And I do agree that the introduction of the same stress factors in various project phases will cause different reactions and behavior of the project team. But once you know the symptoms you should be able to start the treatment.